Growing in Grace: Welcome to "Growing in Grace"
Welcome to "Growing in Grace"
Why did I choose "Growing in Grace" as my blog name, you may ask, well there are several reasons. One reason is that I have a plaque with my name on it, and it says this. My name means, "God is gracious" and he has certainly been gracious to me. At the age of twenty-one God gave me new life by the salvation that comes through Jesus Christ. At that time, He began a "Growing in Grace," process in me that has continued for many years. One of my favorite Bible verses is found in 1 Peter 2:2,"As new born babes desire the sincere milk of the word, that ye may grow thereby, if so ye have tasted that the Lord is gracious." I love growing in the knowledge of my Lord and Savior. I also enjoy growing plants and seeing the beauty of them in my gardens, as you can see from the pictures above. I strive to eat healthy foods that are grown. Today I would like to share with you a spinach salad recipe that is very simple to make, but will help to grow a healthy body. 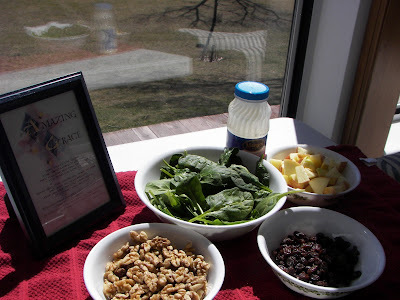 I use organically grown spinach, fresh apples and walnuts. You could also add dried cherries, raisins or cran-raisins. My husband and I like Marzetti's Lite Cole Slaw dressing on it. A balsamic vinegar dressing made of equal parts of vinegar and maple syrup is excellent as well. 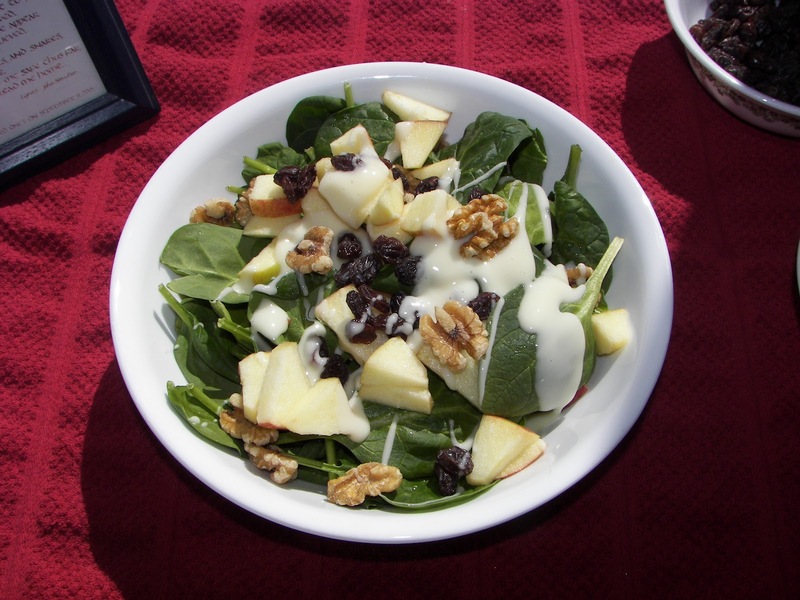 For each serving size I would suggest 3 cups of spinach, 1/2 an apple cut in bite sizes, 1/4 cup of chopped walnuts and dressing to taste. Mix together and you are ready to enjoy. 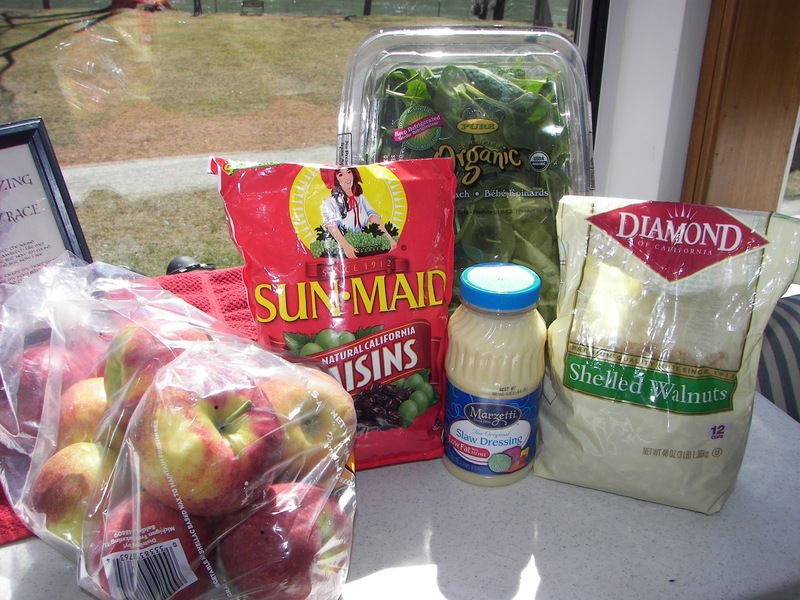 Jo-Ann, saw your link on Frugal Girls Link Party and wanted to come over and look at your recipe. Looks really yummy. I love spinach leaves when I get salad out at restaurants but never think to grab them at the store. Hoping this recipe stays with me on my next trip so I can try your recipe. I am glad you saw my link on Frugal Girls Link Party and wanted to look at my recipe. We really enjoy this salad. Hope you do remember to try it. I think you will enjoy it. Thank you for taking the time to let me know. Jo-Ann, wanted to welcome you to link up at my link party starts late Saturday night. It is SweetTalkin' Sunday, you can check it out on my blog. Will be #10 this week. Hope to see you there. Thank you so much for inviting me to link to your party. I am looking forward to checking your blog out. I just love your fresh crisp salad, I really like the combination of flavor in the salad. Hope you are having a great week end and thank you so much for sharing with Full Plate Thursday. I am so glad you like my salad. I am having a great week. My daughter and family are visiting. I am also enjoying blogging. Thank you so much for becoming a follower of my blog. Jo-Ann, your salad looks wonderful and healthy! Perfect for a Spring lunch! Stopping by from Metamorphosis Monday. So happy you came over and linked this up to my link party SweetTalkin' Sunday! It still looks yummo!! Hope you come back next week!! Thank you so much, I will come back next week. Hope you try it. We had it for dinner tonight. It is so refreshing. Thank you for stopping by. Hope you will return there soon. Yum yum. This looks so delish. Thanks for sharing. 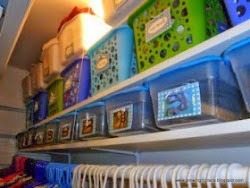 I would love if you could link this up to our linky party going on right now. Thank you for viewing my blog and for inviting me to link up to your linky party. I look forward to that. Salad looks amazing! I love spinach and the toppings are great, plus it is really healthy!! Thanks for linking up to Scout's Sweet Sundays! P.S. I am your newest Linky Follower!! Thank you so much for the encouragement of becoming a follower. I hope you will try the salad. We really enjoy it. I am new at this with a lot to learn but I am enjoying each blog.